Promoting Procol Harum: your votes did it! The results of the voting on Norwegian radio for the best single ever is now official and A Whiter Shade of Pale won with 22% of the votes. Number two was the Beatles' Strawberry Fields / Penny Lane with 14%. 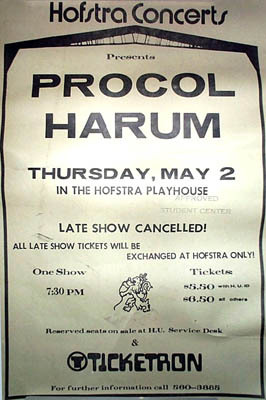 Thanks to everybody who voted for Procol Harum. You really made a difference! You can join in at any time during the celebrations with every chance of winning one of our roster of great prizes, one unique, one almost unique! Which one do you most desire to receive in the New Year mail? UK Palers: remember to set your video-recorders to catch Gary on Jools Holland's BBC2 Hootenanny: either at 11.55 pm on 31 December, or at 1.20 pm the following afternoon, or both. Full advice about how to play is at the Puzzle page, and there's a Demo Puzzle so that you will be in no doubt what to do. You can join in at any time during the celebrations with every chance of winning one of our roster of great prizes, one unique, one almost unique! Which one do you most desire to receive in the New Year mail? Did you see the Salty Santa picture on the front page of BtP during Christmas? Here is a last chance (this year) to see it. Thanks to Tito Davila for this. A Merry Christmas to all Palers from Jens and Roland … thanks for all the e-cards! 'Beyond the Pale' has its origins in Scandinavia, where a sequence of little conundrums (or conundra?) is a pleasant annual Yuletide tradition. This year's theme is that of a treasure hunt, and it starts here. December 24: One hundred and seventy-five days until Procol Harum and the Hallé Orchestra play Manchester UK; countdown for Norway coming soon! "Bravado won through and it was a fantastic night for the band …certainly a heart full of inspiration from the meeting at the Civic Hall on the eve …"
Also added a transcript of the above, with numerous links: please click on them to relive the experiences Gary's message relates. Added a page introducing this year's Christmas Puzzles. Habitual Palers will know that 'Beyond the Pale' has its origins in Scandinavia, where a sequence of little conundrums (or conundra?) is a pleasant annual Yuletide tradition. The first of our twelve puzzles will be available from this page on Christmas Day, and you can join in at any time during the celebrations with every chance of winning a prize. So please have a look at the Puzzle page, and follow the Demo Puzzle so that you will be in no doubt what to do .. and have a look at our roster of eight great prizes, one unique, one almost unique! Which one do you most desire to receive in the New Year mail? A Whiter Shade of Pale is in the lead in the Norwegian best-record-ever poll but the Beatles are catching up. To confirm Procol Harum's lead please click here, and select AWSoP before you press the button labeled "Stem". If PH are still rightly on top of this poll when it closes, it will be a huge publicity advantage to the organisers of the Norwegian concert … and to the band. Palers for the Norway gig are already coming forward: read all about this concert here. Coming tomorrow … all about BtP's annual Christmas Competition: this year, one unique and one almost-unique Procol prizes. Added a dream come true for webmaster Jens … details of a Procol Harum band-only gig on 26 May in his home-town. Please explore this suite of pages and share his delirious delight! If you ordered this album already, please be aware that it is on its way to you now! This album will be one of the prizes in this year's excellent BtP Christmas Puzzles, coming soon! Copies of the Official Double CD Souvenir of the Palers' Band are now shipping (thanks, Hermann and Helga) … thanks to everyone for being patient while the printing was being done. Continuing online orders for this 20-dollar album are most welcome: do have a listen to CD1 clips and CD2 clips before you buy. Added some fine pictures of Procol Harum with orchestra and chorus from October 1972 (thanks, Hermann und Fritz). Click on the pictures for some lateral surfing to related corners of 'Beyond the Pale'. Pleasing and extraordinary to see the names of so many Palers booking for the big Manchester gig, six months in advance. Click here for direct online booking. Click here to add your name to the list. Gary Brooker is aware of this fans' list: bound to be heartening to the band! Did you get it: Amazon sells the Pilgrim's Progress CD / Video CD for USD 5.49 only. It may not arrive before Christmas, but at that price, how can you live without it? If you are coming to the Procol Manchester gig, please visit the register of Palers attending, and don't book your accommodation without visiting the Procol Base Camp page. Do fans want a Procol Convention in Manchester? Click to let us know. Remember this device, which you can use if you can't decide what Procol music to listen to? No photograph was taken of the entire Palers' Band at Guildford … nevertheless, the Official 2CD Souvenir album manages to depict the entire ensemble in a single image! Tip of the day: Amazon sells the Pilgrim's Progress CD / Video CD for USD 5.49 only. It may not arrive before Christmas, but at that price, how can you live without it? Copies of the Official Double CD of the Palers' Band are now manufactured and the graphic design is done: we hope to be able to send them out shortly (people who have already ordered have received an e-mail to this effect). Continuing online orders for the 20-dollar album are most welcome: listen before you buy to CD1 clips and CD2 clips.